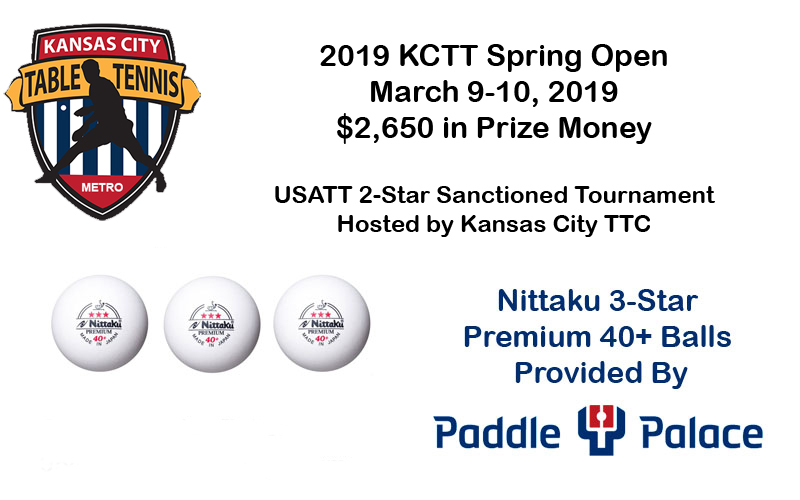 The 2019 Kansas City Table Tennis Spring Open brought in a plethora of talented individuals, all trying to test their skills against one another to capture one or more of the 14 crowns up for grabs. The first main event of the tournament paired up hometown favorite, Arjun Garapaty (1446), against the out-of-town underdog, Janek De Guzman (1135), in the finals of the junior event. With only his parents in his corner, Janek pulled off a very convincing upset, 3 games to 1, to win the first highlighted event of the tournament. 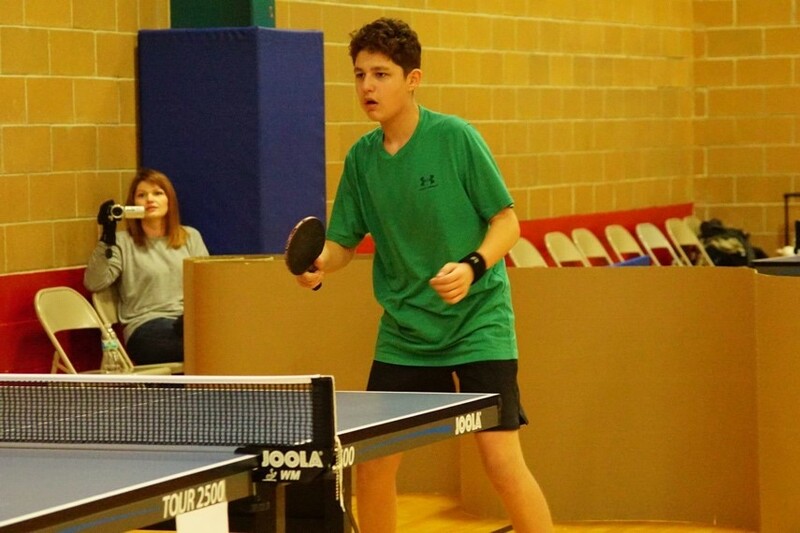 Following the outstanding play the two juniors displayed on Friday night, some of the top players in the KC area and Midwest drove to the Tony Aguirre Community Center on Saturday morning to test their serves and loops against the other competitors, in order to obtain the main title of the tournament, Open Champion. Bektemir Ysmailov (2207) from the University of Nebraska, and Parviz Mojaverian (2121) from the Kansas City area, held seed through the round robin stages to earn their places in the semifinals. The two quarter finals saw Drew Angell (1881) upstage Janek’s father, Piotr Juszkiewicz (1921), who was not able to pull off the same type of magical performance his son had the previous night. On the other side of the bracket, Collin Henslee (1987) dominated his opponent, Toraj Ighani (1748), to set up a semifinal matchup with a familiar foe in Parviz. Bektemir and Parviz both won convincingly against their formidable foes, 3-1, to set up the match that everyone wanted to see. After falling down two games to one against the lower seed, Bektemir started to push Parviz to his limits in the fourth game. 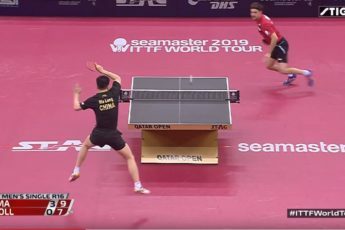 The much younger college student showed determination and resiliency with every push and loop and was able to force a fifth game in front of the massive hometown crowd cheering against him. With his teammates in his corner, Bektemir pulled through in the fifth to win the prize possession of the entire tournament and etch his name into Kansas City history. Following the amazing display of tactics presented in the Open Championship, the U1500 final paired up one of the KCTT President’s (Joe Windham) students, Drew Perez-Smith (1298), and the top seed, Dilip Garapaty (1429). In a shocking turn of events, Drew was being coached by his father, Ryan Smith, and Dilip was being coached by Drew’s coach, Joe Windham. While this may have affected most players in this situation, Drew remained unfazed and trusted his father’s advice, all the way to a massive 11-9, 11-2, 11-9 win for the U1500 crown. After playing for an entire day, everyone showed up on Sunday morning with slightly less in the tank, a grudge to settle from the day before, and a cleaned racket ready to counter loop and chop their ways to the finals of their respective events. The main event for Sunday was U2000, and it produced excellent matchups, just as expected from some of the most consistent U2000 players in the Midwest. Advancing from the round robin stages were the top 5 players, and the 7th seed, Alexander Anuraga (1736), who managed to beat an equally talented Toraj (1748) in a thrilling 5 game match. Once again, the top seeds held their own against the field of players trying to pull of one last upset before the drive home. 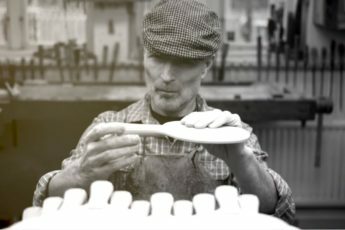 One week after playing each other in the finals of the 2019 Sergeant Bluff Spring Tournament, Collin Henslee was out for revenge against fellow top seed, Jeff Johnston (1945). Jeff, once again, proved to be too difficult of a matchup for Collin and easily won 11-7, 11-8, 11-5. 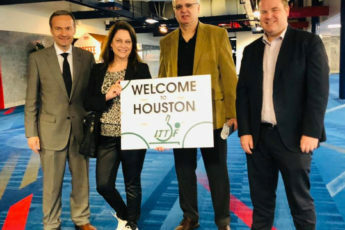 Kansas City Table Tennis and the tournament director, Dylan Garland, would like to thank everyone who took time out of their weekend to come and participate in the event. 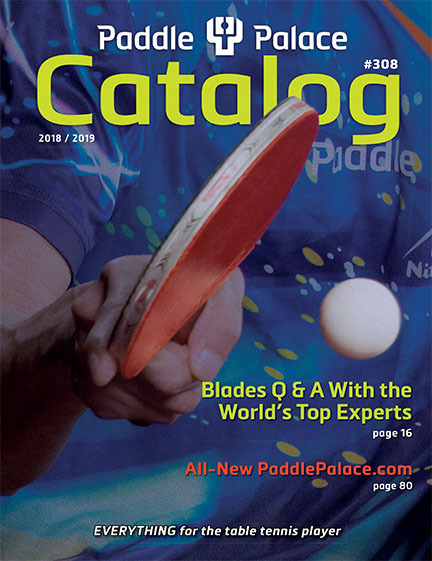 A special thanks goes out to our main sponsor, Paddle Palace, for always providing the Kansas City area with the top of line tournament equipment and for always growing the sport of table tennis no matter the type of environment and obstacles in their way.